Richard Owen (1848) introduced the term homology to refer to structural similarities among organisms. To Owen, these similarities indicated that organisms were created following a common plan or archetype. That is, although each species is unique, the plans for each might share many features, just as the design plans for a Honda Civic and a Honda Prelude might be similar. 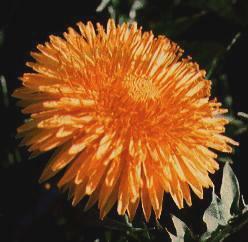 Nevertheless, if every organism were created independently, it is unclear why there would be so many homologies among certain organisms, while so few among others. It is also hard to make sense of the fact that homologous structures can be inefficient or even useless. Why would certain cave-dwelling fish have degenerate eyes that cannot see? A structure is similar among related organisms because those organisms have all descended from a common ancestor that had an equivalent trait. Ridley uses a specific definition of homology: "A similarity between species that is not functionally necessary." I interpret this as: "A similarity between species that exists despite several plausible alternative traits that would function equally well." The genetic code for protein-coding genes is nearly universal in eukaryotes and prokaryotes. The exceptions include most mitochondrial genomes and some nuclear ones (e.g. Mycoplasma and Tetrahymena). Even in these cases, the genetic code is quite similar. Millions of alternative genetic codes exist, so why do all organisms have nearly the same one? Since the anti-codon is at the opposite end from the amino acid binding site of a tRNA and does not interact with the binding site, there is no chemical necessity for a codon to be assigned to a particular amino acid. The genetic code is homologous among living organisms: it is similar despite the fact that there exist many equally good genetic codes. The common ancestor to all known organisms had a genetic code similar to what we see today. Over the ages, the genetic code has passed unchanged (or nearly so) from parents to offspring, because mutations to the genetic code would have been disastrous (changing the amino acid sequence of all proteins produced). Similarly, the plasma membranes of all organisms, eukaryotic and prokaryotic, are structurally similar, consisting of a phospholipid bi-layer. Many other possible membrane structures exist. The hydrophobic fatty acid tails could be joined. There could be three hydrophobic fatty acid chains. Other hydrophilic groups could be involved besides glycerol phosphoric acid. The similarity of the plasma membrane (as well as other cell structures) suggests that all living cells have descended from an ancestor with a similar membrane structure. One of the classic examples of a homologous structure is the pentadactyl (= five digit) limb. 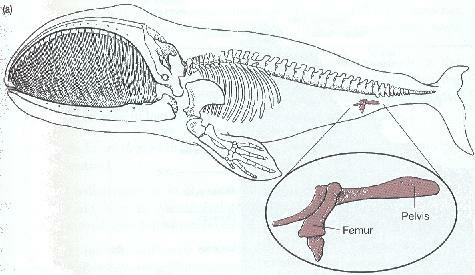 All tetrapods (= four legged) have limbs with five digits, at least at some stage in development. Certain tetrapods lose some of these digits during development, as in the bird wing shown here. But if the bird wing does not need five digits, why do five initially develop in the growing embryo? The most plausible explanation is that while the five digits are not functionally necessary, they represent a genetic artefact inherited from the ancestors of birds. Evolution works primarily by modifying pre-existing structures. That is, even when two species function in completely different ways, they often use homologous structures to carry out those functions. 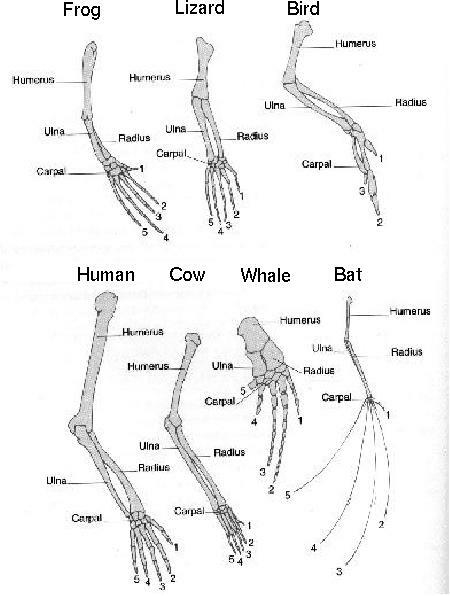 For example, birds and bats fly rather than run on all fours, yet their wings are modified fore-limbs rather than completely novel structures. Structures that are functionless in a species but homologous to a functioning structure in other species are particularly difficult to explain except under the theory of common descent. Such structures are known as vestigial structures. Vestigial structures are extremely illogical if each creature were independently created, but make sense if organisms inherit traits from their ancestors with gradual modification over time. One of the striking features about similar structures are that they cluster. Certain species share many similarities at every level of organization (e.g. humans and chimpanzees), whereas other species only share certain nearly universal homologies (e.g. humans and Escherichia coli). 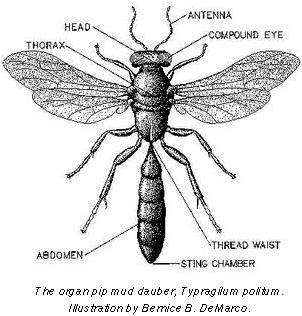 This observation makes little sense for created objects, since a creator could mix and match features observed in any organism. By contrast, under the theory of evolution, we would expect the number of shared homologies to be high for closely related species and to decrease over time as the species diverge from each other. 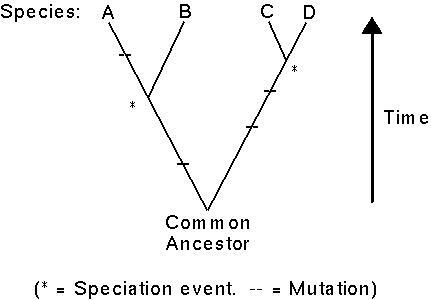 Here, species C and D would have identical sequences, species A and B would only differ by one mutation, whereas A-C and A-D would differ by four mutations and B-C and B-D by three mutations. In fact, "relatedness" among organisms is determined by how many (and which) features they share. Although different traits may reflect the evolutionary history of a group of species slightly differently, there should be rough correspondence. For example, morphologically, humans and chimps are much more similar than are humans and gibbons. If this is because humans and chimps are more closely related (=have had a common ancestor more recently), then we would expect the DNA sequences of humans and chimps to be more similar as well. (c) noncoding regions of the -globin gene. 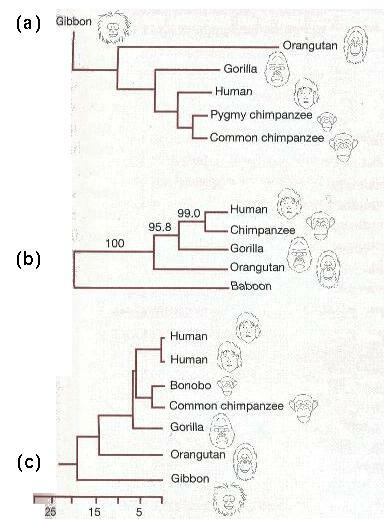 All three trees show that human and chimp DNA sequences are more similar on average than are human and gibbon or human and orangutan sequences. Homologous characters can also be identified in fossil organisms, where they also tend to exhibit a nested series rather than non-overlapping categories. Among dinosaur fossils, some taxa share few traits in common with birds while others share several. 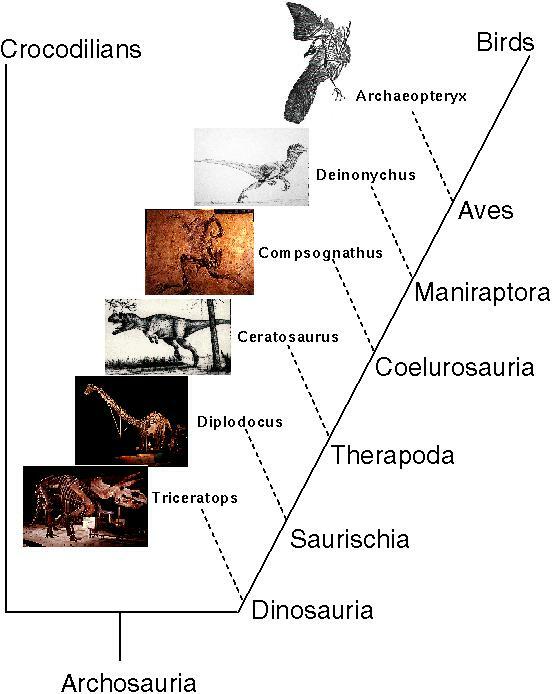 In particular, maniraptors share more traits in common with modern birds than do any other type of dinosaurs. 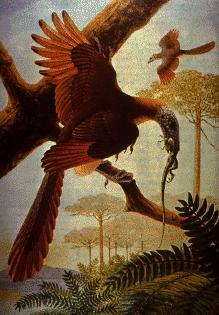 Similarly, coelurosauria besides maniraptors share some, but not as many features of birds. This nested series is thought to represent the evolutionary trajectory of dinosaurs along the lineage that led to birds. Although the fossil record is often poor and incomplete, there are certain deposits where sedimentary layers remain in a nearly continuous series. Fossils from these series provide direct evidence of evolutionary change. Sheldon (1987) examined a series of sedimentary layers from the Ordovician period (500 MYA) containing trilobite fossils (extinct marine arthropods). Samples were obtained from every three million years. The number of ribs of each species of trilobite changed over time (=evolution). Some of these changes over time were so large that the animals at the end of the series are assigned to a new genus! An even finer scale analysis was performed by Malmgren et al. 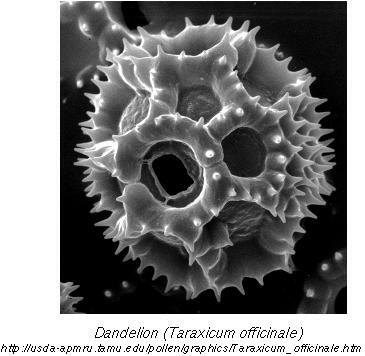 (1983) on a species of foraminiferan (shell-bearing protozoans) from 10MYA to recent times. [Three epochs are represented: Miocene (M; 23.8-5.2 MYA), Pliocene (P; 5.2-1.8 MYA) and Pleistocene (Q; 1.8 MYA - 10,000 YA)]. Over this period, the fossil shells evolved a larger, thicker shell, with a more pronounced ridge. 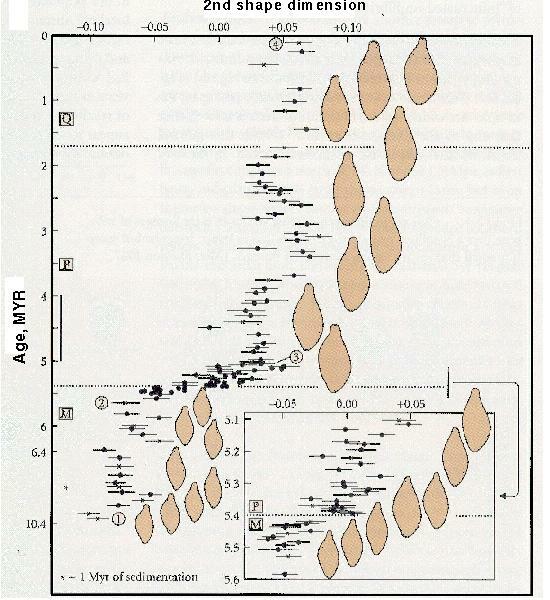 Although the fossil record demonstrates that change occurred in a continuous manner (=without breaks or jumps), the rate of change was not always the same: shape changed most around the Miocene/Pliocene boundary. These changes were large enough that the lineage is assigned to the species Globorotalia plesiotumida in the Miocene, but to the species Globorotalia tumida afterwards. 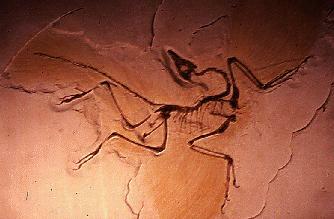 The fossil record demonstrates evolutionary changes do occur. The disadvantage of the fossil record is that it is generally difficult to determine the selective forces that may have contributed to these changes. The advantage of the fossil record over present-day observations of evolution is that higher order evolutionary changes may be tracked (e.g. the origin of new species, new genera, etc). Pentadactyl limbs: Ridley (1997) Evolution. 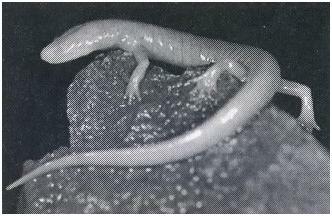 Whale, salamander, primate trees: Freeman and Herron (1998) Evolutionary Analysis. 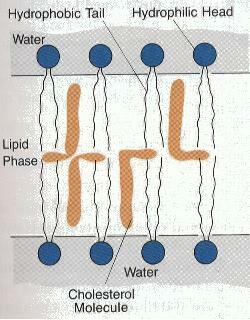 Membrane photo: Wessells and Hopson (1988) Biology. Dinosaur information: UC Museum of Paleontology. Trilobite and foraminiferan fossil record: Futuyma (1998) Evolutionary Biology. Back to Biology 336 home page.